It’s the first day of Spring! I used to be a complete fall/winter gal, and as far as loving cardigans to a fault, I still am. But the new mother side of my life has made me crave warmer weather, the ability to leave the screen door open so we can hear the birds, and not worrying if my kid is constantly too cold. This time last year, I had a two week old baby in the house. We were scared and bewildered, yet happy to have her as a part of our pack. It’s been such a learning process. Is there a “right” way to do things? Well, if there is, I was sure on the hunt this year. I asked every person I knew who might have an ounce of understanding or empathy, what they thought the “right” way was to feed/sleep/play/instruct my baby. I’m sure they, like me, are breathing a sigh of slight relief that along with her first birthday passing, so has a large amount of my questions. I think part of me craves that close knit village type atmosphere of raising a baby. Mothers, grandmothers, aunts, cousins; all within arms reach of advice. While that isn’t our reality, I am very thankful for technology that has made virtual villages out of our spread-apart lives. One of my favorite parts of this “virtual village” is the way in the short time this blog has been up and running, I’ve been able to answer questions of fellow moms across several states on the basics of cooking, what to cook for baby, where on earth do you get Chinese 5 Spice?! and so on. I love cooking so much and I hope that along the way, I can make at least one other person excited to cook a meal for their family or try something new. I love when someone tells me, “I salt my pasta water because of you” (which is funny because at least three people have told me this, and I learned it from Mario Batali. Salty like the ocean!) I feel useful, even though I might be stuck in this house (or feel stuck from time to time), I feel knit together with so many by a common ambition for the quest for good food and a simple sense of accomplishment. In a small bowl, use the back of a spoon (or I use a drink muddler) to mash the garlic clove with the salt and pepper. Add the lime juice and whisk until the salt is dissolved. Add the olive oil, whisking until incorporated. Whisk in the honey and red pepper sauce. In a large bowl, toss the greens with enough dressing to make the leaves coated, but not too heavy. Arrange the arugula on a large platter. 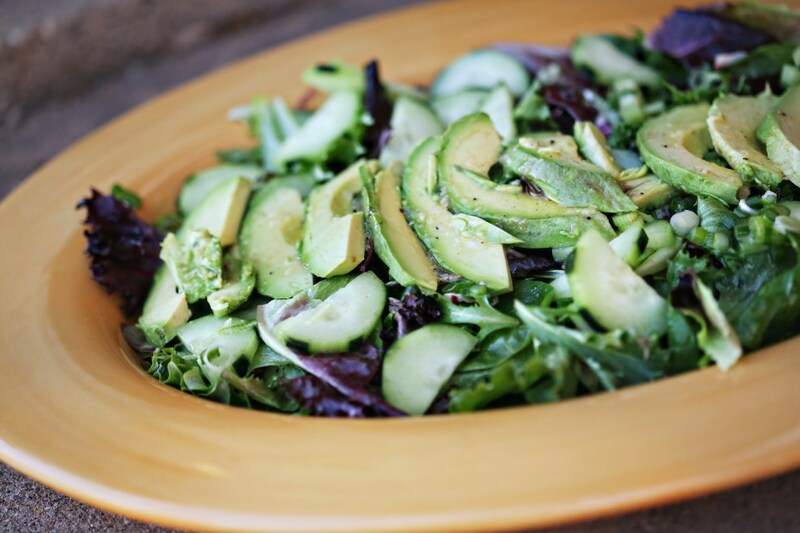 Toss the cucumber and scallions with a bit of the dressing and arrange them on top of the greens. 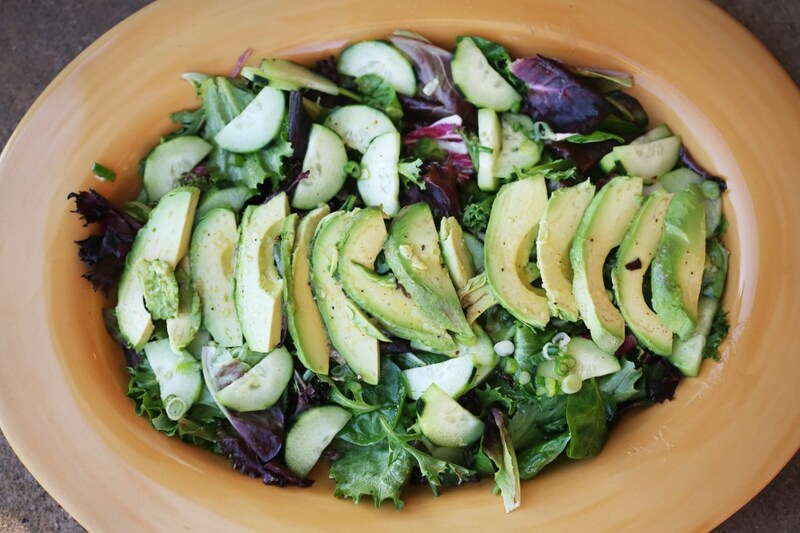 Arrange the avocado slices across the top of the salad. Drizzle just a little more dressing on top of the avocado and serve.